From our early days, originally posted August 1, 2007, our first in our series called, over-ambitiously, Web Conferencing Week. The entire group can be found on its own page elsewhere on this site. I do web conferencing. But you might be surprised that videoconferencing is often what my web conference supplements — right there in the conference room. Videoconferences predate web conferences by many years; although the state of the art is still as primitive as it is, one reluctantly admits, for web conferencing. It’s all about the bandwidth. Let’s take a look at this recent story from Computerworld, regarding what appears to be a pricey, but better, mousetrap for the videoconference process. It’s still not cheap, but telepresence technology takes videoconferencing a giant step forward. And did we mention that it’s really cool? July 31, 2007 (Computerworld) — If necessity really were the mother of invention, enterprises and small businesses would by now have highly functional, standardized videoconferencing and collaboration technology at their disposal. Instead, travel across the continent and around the world remains the dominant collaboration paradigm, despite the ever-increasing pressure of time-consuming security requirements and budget-killing airfare and hotel prices. Back in the 1960s, the old AT&T Co.’s Western Electric Group demonstrated its Picturephone to a doubting world, and the world has remained doubtful ever since. That’s because videoconferencing systems developed since then have remained expensive and unpredictable, gadgets that usually delivered small, fuzzy, herky-jerky video images, often uncoordinated with people’s voices because of communications latency and unreliability. When the Internet came along, there was hope that Web conferencing might fill the void, even though it lacks the collaborative impact of video images, relying solely on shared documents, especially presentations. Web conferencing has not been very satisfactory, requiring reserved bandwidth, separate telephone hookups for sound and notoriously troublesome desktop technologies. I ashamedly plead guilty to all of the above limitations of web conferencing. We don’t use reserved bandwidth in our instance, and we’ve finally gotten some priority (called Quality of Service) over competing internal traffic, but bandwidth, the potential sound quality issues of the accompanying telephone conference that still is required for our web conferences due to flaky VOIP (a subject of a future rant, I’m sure) — all of this adds up to a lot of compromise. Telepresence technology is proposed as a spendy answer to the limits of the primitive state of current videoconferencing, and may well obviate the need for my specialty, web conferencing. 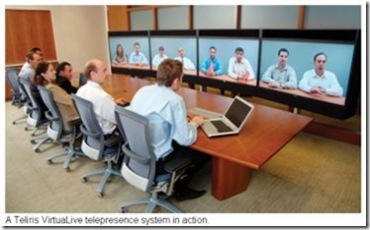 Telepresence configurations can use as few as one HDTV screen or as many as 16. Screens are positioned to be at eye level when local conferees are seated, and the images on the side-by-side screens are “stitched” together so that viewers feel they’re looking at one very wide screen. Speakers are positioned so that the sound appears to emanate from the mouth of the person at the remote site who is talking, not from the center of the table or some random location elsewhere in the room. Okay so the illustration, provided by one of the vendors, is somewhat idealized, but HOW COOL IS THAT?! Telepresence is an expensive technology, and only enterprise customers with large travel budgets can afford it. Once installed, telepresence systems are essentially free to operate, but it’s the installation that’ll get you. 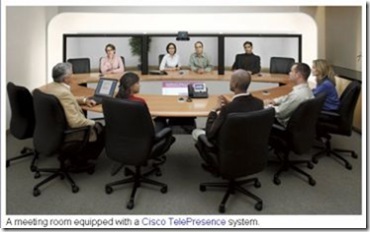 A single-screen Cisco TelePresence system can be installed for $79,000 and a three-screen system for $299,000 per room, according to David Hsieh, Cisco’s director of marketing management. You have to multiply that by the number of rooms planned for the telepresence network. Teliris VirtuaLive system costs are similar, with a single-screen room costing $60,000 and a four-screen room coming in at $250,000. Those costs include access to the Teliris dedicated network. It’s expensive, but large enterprises, such as the one that employs yours truly has significant travel budgets, important outposts all over the globe, and the numbers just might work. The factor that remains the greatest limiter to success with this otherwise ferociously attractive technology, is as with web conferencing I’ve learned the hard way these past five years, the state of the network. Networking has always been the Achilles’ heel of traditional videoconferencing, and it’s still a concern with telepresence. If the video isn’t smooth and perfectly coordinated with the audio in real time, the whole system devolves to being just like traditional videoconferencing. That’s important, says Ferguson. “With traditional videoconferencing, you can only sit there for about an hour. But with telepresence technology, a two- or three-hour meeting is quite reasonable,” he says. As a result, one vendor runs their systems on a proprietary network, increasing the opportunity for a successful connection, but obviously representing an increment over using existing corporate network facilities. [Teliris’] Telepresence Gateway can also communicate with traditional videoconference technologies, such as those offered by Polycom, and Web conferencing technologies such as WebEx and Microsoft’s LiveMeeting. Teleris also offers WebConnect, a Web-based telepresence product that enables a conference participant who is unable to be at a VirtuaLive-equipped site to join a conference. As Dewing points out, you don’t need expensive telepresence for applications like telecommuting, but linking traditional systems into telepresence systems can give those applications a boost. I’m certainly aching to learn how soon our vendor, IBM/Lotus will provide a communications interface to this awesome tool for its Sametime web conferencing tool. Because, no one has mentioned it to me (crawling around in the trenches as I do), but I’m certain one or more of those fancy installations is either planned, or already installed somewhere in the enterprise I call home. And, let me explain why web conferencing tools even belong in the conversation about videoconferencing. You still need to see the presentation, and a web conference provides a very elegant solution. At some of our organization’s highest level meetings, with video going out to several important sites, I’m sitting near the audio and video techs in the room sending out the slides via web conference, because they’re much easier to read in a medium optimized for presentations. The standard procedure is to use one of the screens in the receiving videoconference rooms for the web conference feed. Notice the illustrations above: people — big beautiful high definition people — but not documents. That’s the job of web conferencing, and I want in on that telepresence action. Soon! This entry was posted on Wednesday, April 23rd, 2008 at 10:00 am and is filed under Business, Technology, Travel, Web Conferencing, Web Conferencing Week. You can follow any responses to this entry through the RSS 2.0 feed. You can leave a response, or trackback from your own site.